Barack Obama’s historic election campaign in 2008 had immortalized a new slogan throughout the world: “Yes we can”! If a people wanted to, they could truly conquer the establishment and bring about ‘change we could all believe in’. In many ways, the election of a junior senator of African descent to the most powerful political position on the planet, usually the preserve of aged white men with elite pedigree, was a revolution in its own right: That night in Chicago was a nationwide American Tahrir Square moment of sorts. Two years into his presidency, Obama’s first term now seems entirely, almost fatalistically, geared towards his re-election bid; the new slogan he might be going for this time will be “bear with me, I’m trying my best here”. Although it seems many followers have grown disenchanted with his failure to ‘live up’ to the sometime unworldly expectations placed on his shoulders, I could not help but find parallels between his election and what is currently taking place in North Africa : widespread disillusionment. Libya and Egypt’s streets have been the scenes of incredible popular movements calling for radical change in their countries’ polity, starting with the departure of their autocratic leaders. Before them, the ‘Arab Awakening’ had found its roots in neighbouring Tunisia where it took no longer than a month to oust former president Ben Ali and his regime. Tahrir Square, Sidi Bouzid, Benghazi, Mohamed Bouazizi, Wael Ghonim, the flag of a new Libya, all these things had become rallying symbols of a truly inspiring movement which swept through the region like wildfire. In essence, we lived our own collective ‘Yes We Can’ moment which to a certain extent has already delivered previously unthinkable change… Or did it? Though Libya’s fate remains unclear, the situation elsewhere seemed unambiguous. The departure of Tunisia’s Ben Ali, followed weeks later by that of his Egyptian counterpart signalled the end of an era in these countries. And yet it seems that both revolutions have awakened to groggy mornings-after. The unity once showcased by these revolutionary movements has been replaced by bitter partisan battles. Widespread inertia, once the bedrock for decade-long oppression, seems to have returned. In Tunisia, the political landscape seems to have dramatically changed since the fall of Ben Ali. Tunisians are able to express themselves and their differences through newfound freedoms. Newspapers and Television stations have been liberated from the grip of fear and are now readjusting to real journalism. Similarly, countless political parties have been created and many leaders have begun presenting their bids to the Presidential elections expected in the coming months. In the aftermath of the Tunisian Revolution, endless protests over his close ties with the former regime proved to be the end of Prime Minister Ghanouchi. A former figure of the ruling party RCD and a confidant of former president Ben Ali, his political survival/revival in a new Tunisia seemed doomed before it ever took off. He has since been replaced by the Bourguiba era’s former foreign minister, Beji Caid Essebsi. During his first major interview, the new Prime Minister made a point which I found particularly powerful. In light of his current task, he noted that his generation, that of the Bourguiba era, was partly responsible for allowing Ben Ali to rule in the way he did and as such it was his duty to rectify the errors of the past. Despite his old age, there seems to be trust in and esteem for Essebsi who has reiterated his primary focus of carrying out a ‘de-benalification’ of the political scene, as well as seeing through the current democratic transition. His new government’s choices are relatively encouraging. Composed of respected figures of civil society and young technocrats, the current team has the possibility of truly preserving the revolution’s ideals and objectives. Despite these significant developments which might leave room for hope, it is clear that the political leaders in Tunis seem exclusively turned towards making promises, speaking out and being active in the aim of reaping political benefits in the new Tunisia. Meanwhile, policies which might solve the day-to-day socio-economic problems that triggered the revolution in the first place, seem to have been banished to the closet for now. In all of this, the Islamist enigma is what continues to loom over the Tunisian revolution’s aftermath. Generally absent or withdrawn from the protests which led to Ben Ali’s demise, the Tunisian Islamists of Ennahda were reinvigorated by the return from exile of their hugely popular leader Rached Ghanouchi. Though Ghanouchi has made a significant effort to distance himself from the image of a Tunisian Khomeini, his credentials and positions on key issues of Tunisia’s largely secular society have yet to be truly tested. Though some have gone so far as to compare his party to the moderate AKP of Turkey, only time will tell whether or not they are truly a dangerous or positive force to be reckoned with in the country’s new political landscape. In neighboring Egypt, a resurgence of political Islamism seems as plausible as ever, as the brotherhood and various other organizations step up their campaigning efforts. Indeed they have returned to occupy the public scene like never before. Like Tunisia, Egypt’s media is now more critical and certainly more partisan. The revolution is now claimed by everyone in the aim of bolstering their efforts in coming electoral battles. Though the Egyptian army was meant to return to its barracks following Mubarak’s gentle destitution, its highest-ranking officers continue to head the government and, as such, the democratic transition. Though the army remains largely popular among Egyptians, it has lost a significant amount of support following its handling of the current transition. Egyptians, particularly amongst the revolution’s key figures and actors were furious at the impunity given to former regime members. 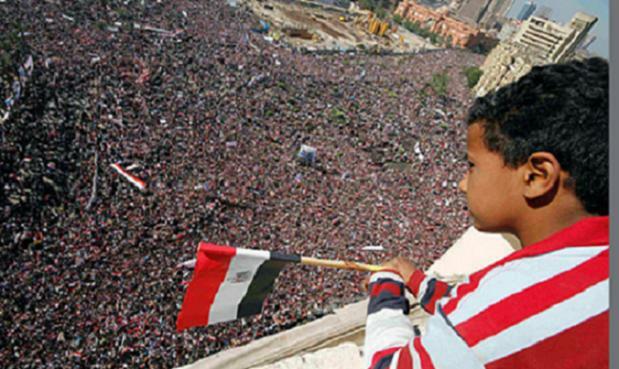 On April 8th, many took to the streets and reclaimed the symbolic Tahrir Square to demand that former figures of the previous regime be brought to justice and that the government legislate severely on corruption. Fearing post-revolutionary protests like in Tunisia, the army hurriedly set up a commission to examine allegations of illegal enrichment by the Mubarak family and its associates. The former Rais’ sons Gamal and Aala, the would-be heirs of the Mubarak legacy, are now under arrest and under intense interrogation by the police. Even their deposed father, who recently suffered a severe heart attack and was rushed to a nearby hospital in Sharm El-Sheikh, was told he would continue to be interrogated at his bedside. These measures certainly go a long way in ensuring Egyptians regain trust in the ‘new’ leadership. All in all, the situation in both countries and, to a certain extent, in ravaged Libya can certainly be qualified as revolutionary hangovers. Overwhelming optimism and the euphoria of historic and hard-earned victories have been replaced by the unforgiving realities of difficult decision-making and consensus-building in hard-to-manage economies. The transitions towards democracy are made all the more difficult by a varied ethnic and religious backdrop and the proliferation of countless new political entities eager to exist following decades of silence and oppression. We can only hope the Arab ‘Yes! We Can!’ will not become a ‘Oh! How we could have!’.